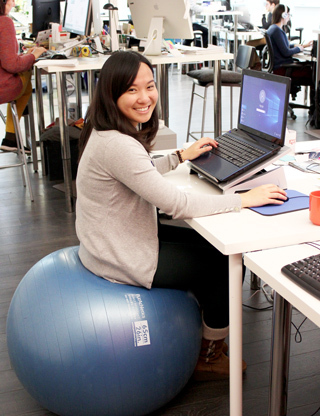 Standing desks, sitting desks, yoga ball chairs. The workstation possibilities are endless at the Ayogo! 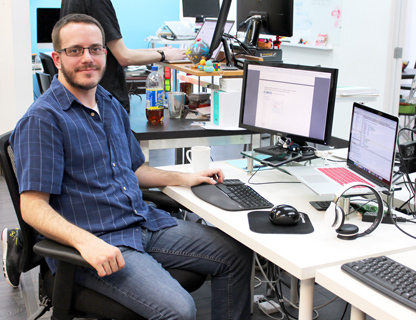 We asked a few Ayogis to share their fun workspaces, and tell us how they like to get work done at the Ayogo office. Mid-afternoon drowsiness and copious cups of coffee just to get me through the day are things of the past since switching to a standing desk! Plus I get to stretch my legs all day and sometimes even dance to some great tunes while I work. Every so often I like to switch it up and use a yoga ball instead of a chair; it keeps my mind (and core!) engaged. I actually require a sitting desk due to my small disability, charcot marie tooth. I need to sit with my feet flat on the ground as to not hurt my ankles and knees, which will get very sore when standing for more than 20-30 minutes. It would be nice to stand on occasion, but instead I make sure to get up and move around frequently throughout the day. 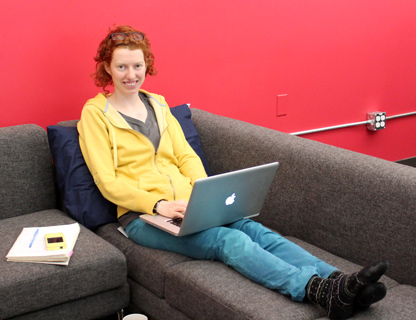 I like having the option to work at the couches; it’s a nice change of scenery from my desk and helps me focus on writing briefs and content for our apps!